The Faculty Teaching and Research Awards Recognition Ceremony was held on Thursday, October 26, 2017 in the Margaret M. Walter Hall Rotunda. President M. Duane Nellis, David Descutner, Interim Executive Vice President and Provost, Joseph Shields, Vice President for Research and Creative Activity and Dean of the Graduate College, and Howard Dewald, Associate Provost for Faculty and Academic Planning hosted the event honoring faculty who were selected from among excellent groups of applicants as finalists or winners of highly competitive awards. 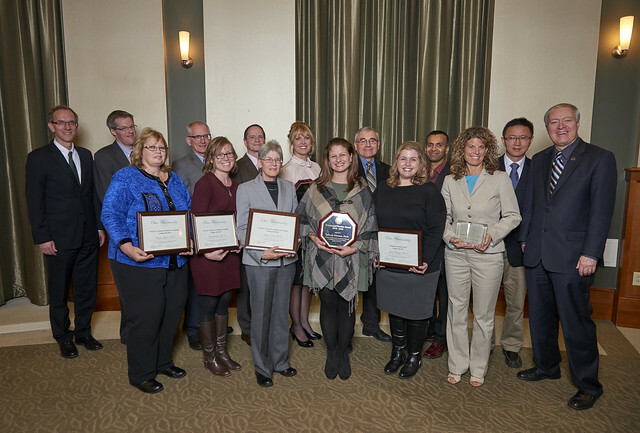 These included Presidential Teacher Award winners and finalists, Provost Award for Excellence in Teaching winners and finalists, and those selected as Presidential Research Scholars.